Background & Objective: Basal cell carcinoma (BCC) is a common skin cancer arising from the basal layer of the epidermis and its appendages. They are locally invasive, aggressive, and destructive of skin and the surrounding structures. β-Catenin is a multifunctional protein located to the intracellular side of the cytoplasmic membrane coded by the CTNNB1 gene, which maps to chromosome 3p22.1. It has a critical role in cell-to-cell adhesion by linking cadherins to the actin cytoskeleton and has a central role in transcriptional regulation in the Wnt signaling pathway. We evaluated the diagnostic value of the Beta catenin immunohistochemistry marker in distinction of aggressive and non-aggressive Basal cell carcinoma. 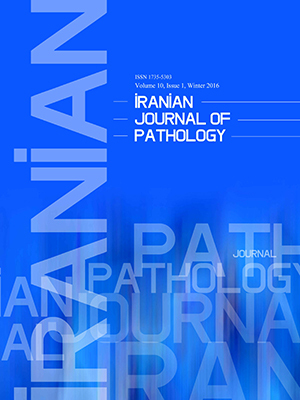 Methods: This cross sectional and descriptive-analytical study was done on archived formalin fixed, paraffin embedded tissue blocks in pathology library of Al-Zahra hospital in Isfahan city. We used immunochemistry to determinate the role of β-Catenin in aggressiveness in BCC with higher rate of relapse. Results: A total of 76 samples were evaluated in two groups (aggressive &none aggressive). The mean percentage of cytoplasmic β-Catenin staining in aggressive group was more significant than the other group (sensitivity: 86.8% specificity: 81.6%, PPV: 81.5% and NPV: 86.1%) and the mean percentage of membranous β-Catenin staining in non-aggressive group were significant more than the aggressive group. Intensity of membranous staining in both groups significant less than normal epithelium. Conclusion: Cytoplasmic β-Catenin staining in aggressive BCC is more significant than non-aggressive subtypes, so this indicates that the use of β-Catenin IHC marker maybe helpful in the diagnosis of aggressive BCC.